Found one file extension association related to Lotus Quickr and 1 file format developed specifically for use with Lotus Quickr. IBM Lotus Quickr is team collaboration software that can help you access and interact with the people, information, and project materials you need to get your work done. Lotus Quickr offers team spaces, content libraries, team discussion forums, wikis, and connectors to make it easy to share documents and information amongst a team. Lotus Quickr has a rich set of features, such as content libraries to share information, team discussion forums to encourage communications, wikis that let your team create and edit content together, and connectors that help make sharing easier and which connect team collaboration with other sofware such as Lotus Notes, Lotus Connections, Lotus Sametime, Lotus Symphony, Microsoft Office and Microsoft Outlook. 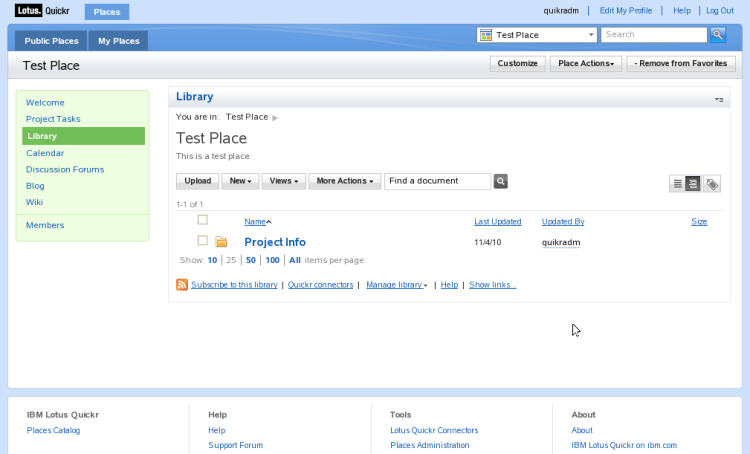 Content libraries and team places: Quickly organize and share content for a project or team. Connectors: Work where you are without switching applications. Templates: Use pre-built team places to get started fast. RSS/ATOM feeds: Stay up-to-date and in the know. If you need more information please contact the developers of Lotus Quickr (IBM), or check out their product website.